This sleek, powerful food processor comes with a whopping 10 accessories. There’s everything from a whisk to a citrus press, along with two attachable feeds to accommodate small and large vegetables. Be sure to have plenty of storage space though, aside from its large bag of add-ons, the machine is nearly half a metre tall, 30 centimetres wide and weighs 5.9kg. The machine performs well with a range of tasks, from grating chocolate and vegetables to making silky smooth sauces and soups. Despite the number of accessories, it’s intuitive to use and incredibly powerful (there’s a 1250 watt motor engine). The machine has good speed control, and works automatically when you put it on max speed (which saves you continually holding the button). The machine also has a light that flashes if the accessories or lid have not been properly attached. Not all attachments are dishwasher safe, which can slow down the post cook clean up. Consider using other attachments than the universal cutter to dice onion and garlic (the universal cutter pulverized these, and was difficult to clean afterwards as it was one of the attachments that is not dishwasher safe). It’s also important to make sure you have sufficient cupboard space to store the machine and all the accessories. 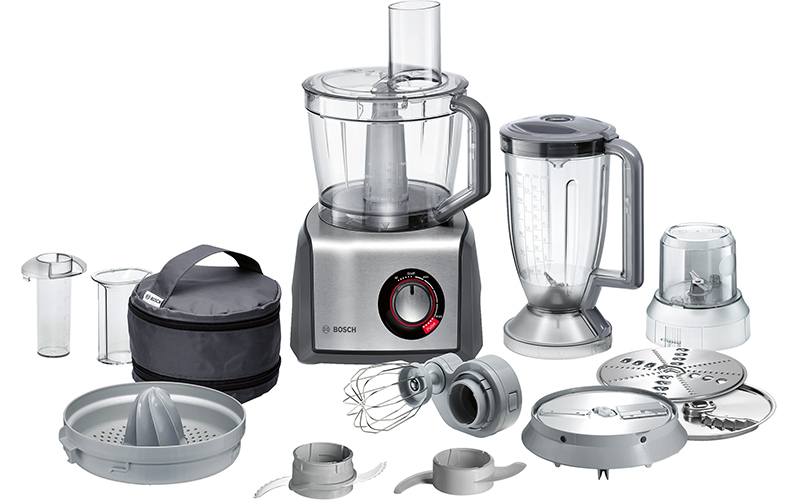 Overall, the Bosch Multi-Talent MCM68861GB Food Processor is a solid all-rounder, and will save you plenty of time doing the more labour-intense kitchen tasks of whisking, beating and slicing. It’s also not limited by size due to the two attachable feeds, making it useful for larger dinner parties or family get-togethers. The Bosch Multi-Talent MCM68861GB Food Processor can be purchased from various outlets across the UAE including Homewide on Sheikh Zayed Road, close to the IBIS hotel Al Barsha, where it is priced at AED 1,029. For more information visit Bosch UAE.